This software was made for a course project. We were given the task to develop a program which interactively visualizes Dijkstra’s algorithm for beginners. We were not supposed to focus on rigorous teaching of the algorithm. First of all, the program should be appealing to people without prior knowledge of computer science. It should keep their attention and convey the message that computers actually make our daily live easier (at least in some regards) by putting Dijkstra’s algorithm into context. 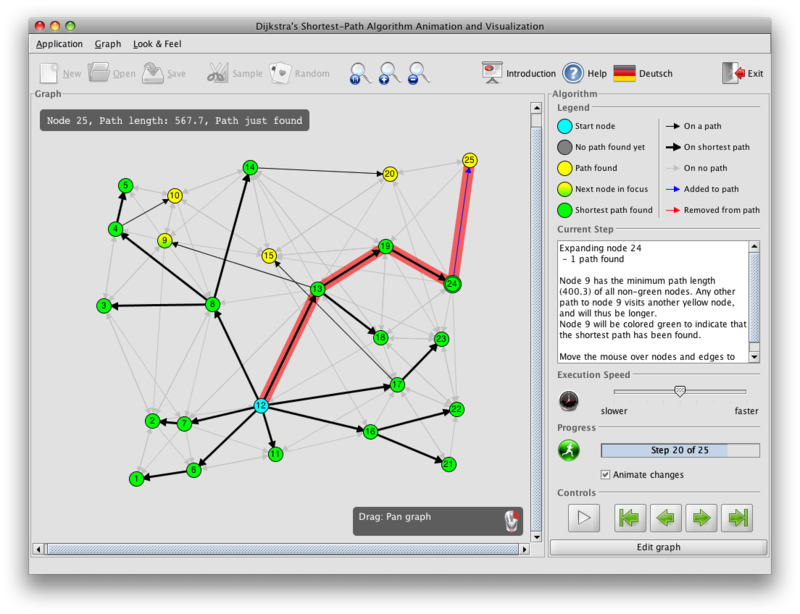 Some of the technical requirements were to provide a graph editor with additional random graph generation and the possibility to save and load graphs. The user should have the possibility to step through the algorithm (forward and backward). Each step the progress made by the algorithm should be reflected by coloring the graph and presenting detail information (on demand).